Our gestures are generally guided by eyes and ears. In another words, humans understand their position in any spatial structure (open or closed) through sight and hearing. This performance will begin in darkness. Gradually, sound will emerge. These sound will ‘initiate’ light. By time, the audience will be able to recognize that light is present because of the sound. We can only see when the light is present. In this context, that translates to: We can only see when there are sound. How does it feel to know that our eyes depends on the ear? How does it feel to know our senses —is in fact— dependent on each other? How do we recognize the spatial sense when both senses have to function at the same time? 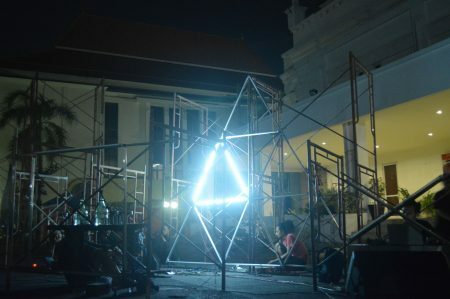 Series of audio-visual performance that involves the installation of 27 fluorescent lamps are assembled into a variety of sizes triangle. One type of sound triggers two lamps. A synthesis programming software is designed specifically to generate the sound in this performance. performance offer the possibility of spatially experiencing what is seen (optical) and what is heard (acoustical) at the same time.